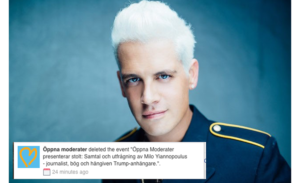 From yesterday until this morning, Swedish young internet savvy right wingers were excited that Milo Yiannopoulos was going to speak at Schönfeldtska in Stockholm, an event organized by Öppna Moderater (a LGBT club associated with Moderaterna, Sweden’s biggest conservativeish party). The event was then canceled after twitter leftists and celebretarians complained about it. The venue, Schönfeldtska praktsalen, is situated in Moderaterna’s HQ. Moderaterna aren’t really known for taking strong stances in regards to freedom of speech nor standing still in shitstorms. The Confederation of Swedish Conservative and Liberal Students (another organization with close ties to Moderaterna) has a history of successful campaigns against the Swedish unions and the left, most of which led Moderaterna to make official statements and clarify that they don’t condone the campaigns. Others joined the chorous in critizing Öppna Moderater for inviting Milo, calling him a “hate preacher” and a “hateful racist”, who was noteventwiced by Twitter itself. Celebretarian Mattias Svensson started a Facebook thread outing Milo and the alt right as “racist rightwing collectivism”, adding that it doesn’t fit into the “true movement for freedom”. It’s unclear whether Milo or other young conservatives who enjoy his fight against the left automagically belong to this racist collectivism or if listening to him speak allows you to still be a true libertarian. I’m sure Mattias Svensson’s celebretarianship and occasional connections to Moderaterna has nothing to do with the party kicking the organizers out. Rumor had it that Öppna Moderater’s Milo event was canceled due to the fact that Milo was suspended from Twitter (again). Nyheter Idag talked to Öppna Moderater’s chair Fredrik Saweståhl (article in Swedish) who confirmed that Milo was an unfit speaker. According to Nyheter Idag, Saweståhl was referring to, among other things, the fight with Leslie Jones. This is the official statement from Öppna Moderater, in which they complain about being outed as supporters of Milo’s opinions – while claiming that they only wanted to know how a gay person possibly could support Donald Trump.